In the previous page we have seen one classification. Here we are going to discuss one more classification. Dense Index: For every records we are having one entry in the index file. Sparse Index: Only one record for each block we will have it in the index file. Primary Index (Primary Key + Ordered Data) A primary index is an ordered file whose records are fixed length size with 2 fields. 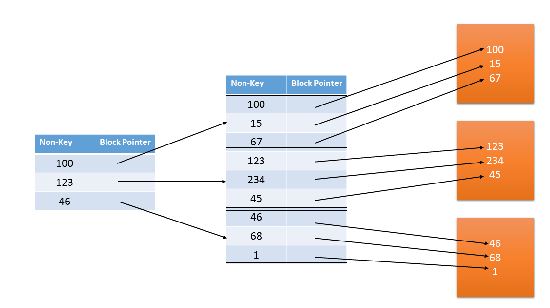 First field is same as primary key and the second field is pointer to the data block. Here index entry is created for first record of each block, called ‘block anchor’. 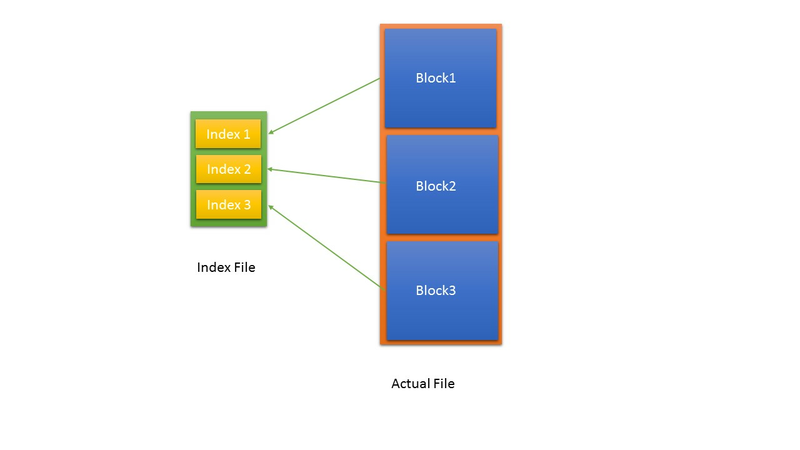 The type of index is called sparse index because index is not created for all the records, only the first records of every block the entry is made into the index file. we have to take only 10 records. Total records = 30000, so total number of blocks = 30000/10 = 300 Blocks. 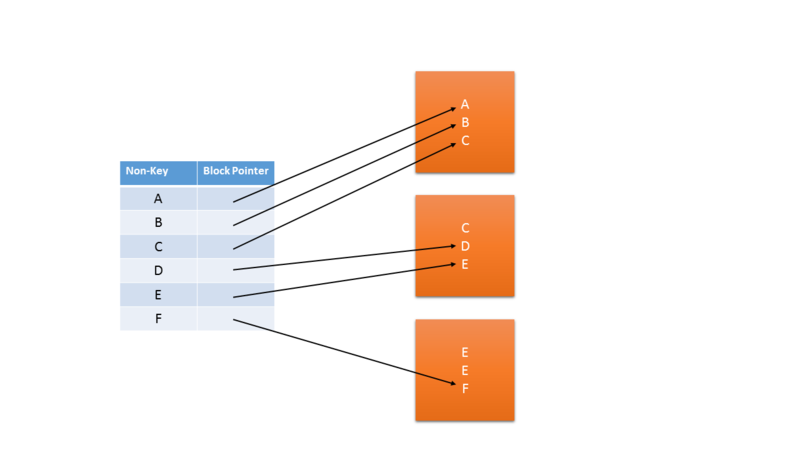 Clustered Index is an ordered file with two fields, non-key and block pointer. Clustering Index is created on data file whose file records are physically ordered on a non-key field which does not have distinct value for each record, that field is called clustering field. Index Entry is created for each distinct value of clustering field. Type of index is dense and sparse both. This a type of dense Index. Secondary Index provides a secondary means of accessing a file for which some primary access already exists. Total Block required = Total record / record per block = 16384 / 64 = 256 This was first level indexing. So to search a record how many blocks will be required = log4 + 1 + 1 = 4 Accesses. Sometimes in the question Block pointer and record pointer are confusing. 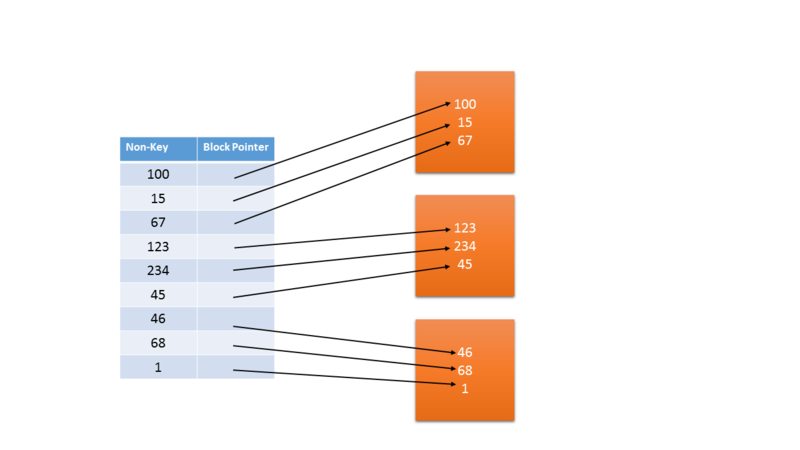 So choose the one which has larger size as record pointer and other will be Block pointer.